On the special occasion of Valentine's day, Lollapalooza is organizing the event Valentine Bash 2019 in Pune, Maharashtra. 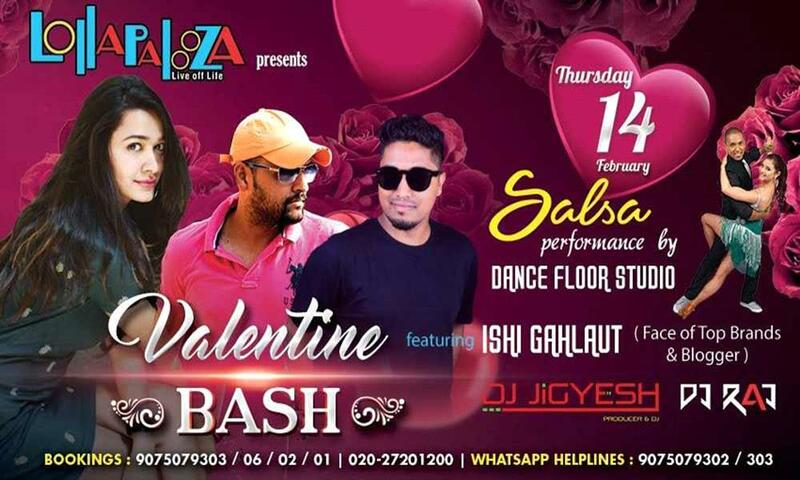 Lollapalooza presents Valentine Bash 2019 which featuring DJ Jigyesh, DJ Raj and ISHI Gahlaut. Get Ready Pune on this Valentine Day for a theme celebration with your loved ones. The DJ’s come for spinning best of Romantic, Love & Bollywood tunes all night Long. The event is also featuring exclusive Salsa performances by Dance Floor Studio (Pune’s Top Dance Academy with Silver Button on YouTube). Don’t Miss the place for your Perfect Valentine Celebration!